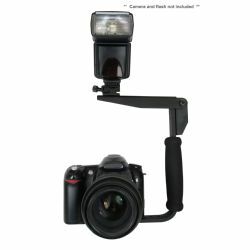 Center your camera on the bracket and attach, like you were mounting your camera on a tripod. The bracket comes with a shoe mount for your camera. Loosen the clamping screw, slide flash into mount and tighten snugly. Connect flash to camera with appropriate PC or type-specific cord. For horizontal shooting, the flash arm stays in the downward position. This seperation between your lens and flash eliminates red-eye and softens shadows. For vertical format, rotate the flash arm 180 degrees. The flash will be repositioned to again be centered high above the lens.